Acon - Inbar (5.03.2019) - Fighter jets in the Israeli Air Force (3) - Dassault Mystère IVA. Distribuidor 00001. ATM nuevo, correo nacional (NIS 2.50). Acon - Inbar (5.03.2019) - Fighter jets in the Israeli Air Force (3) - Dassault Mystère IVA. Distribuidor 00001. Serie nueva completa de seis valores (NIS 2.50 - 4.10 - 6.50 - 7.40 - 8.30 - 9.00). Acon - Inbar (5.03.2019) - Fighter jets in the Israeli Air Force (3) - Dassault Mystère IVA. Distribuidor 00001. Sobre ilustrado de primer día con ATM, correo nacional (NIS 2.50). Acon - Inbar (5.03.2019) - Fighter jets in the Israeli Air Force (3) - Dassault Mystère IVA. Distribuidor 00001. Sobre de primer día circulado a España (NIS 7.40). 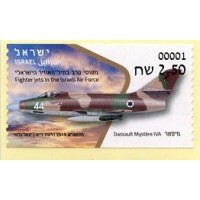 Acon - Inbar (5.03.2019) - Fighter jets in the Israeli Air Force (3) - Dassault Mystère IVA. Distribuidor 0300. ATM nuevo, correo nacional (NIS 2.50). Acon - Inbar (5.03.2019) - Fighter jets in the Israeli Air Force (3) - Dassault Mystère IVA. Distribuidor 0300. Serie nueva completa de seis valores (NIS 2.50 - 4.10 - 6.50 - 7.40 - 8.30 - 9.00). Acon - Inbar (5.03.2019) - Fighter jets in the Israeli Air Force (3) - Dassault Mystère IVA. Distribuidor 0300. Sobre ilustrado de primer día con ATM, correo nacional (NIS 2.50).